To call Moscow a city of contradictions would be to risk sounding cliche, but if any city deserves the title, it is this one. From one of the Cosmos windows I can see the old All-Russian Exhibition Centre, situated in obsolete grandeur across the street. Built in the late 1930s and renovated in the 50s, the Centre was intended to be a monument to Soviet greatness, with wares from every bloc country displayed in huge, beautiful buildings. From the Cosmos, I can see the famous “Monument to the Conquerors of Space,” an impressive titanium obelisk with a steely rocket rocket astride the top. Further to the right, the gigantic gleaming figures of the Worker and Kolkhoz Woman stride forward with startling muscularity. Dimly in the distance, the Exhibition Centre’s “central pavilion” stands tall, its golden “steeple” shining brightly. Further back, out of sight, is the magnificent golden fountain. To me, that Exhibition Centre, as well as the moldering glory of the Cosmos Hotel, represented Moscow in a nutshell. 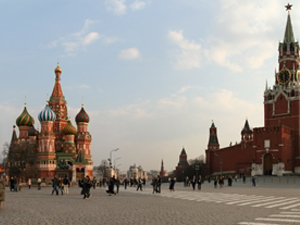 Moscow is not a dead city, but it’s not a fully living one either, just like the country that it inhabits. It is a city that remembers and survives, but does not always press ahead. For instance, the KGB has been thrown from power, but its aging members still walk the streets, bullying passersby and setting up self-important checkpoints. The old Soviet monuments to communism have been abandoned, but only the thinnest tendrils of a free market have begun to overgrow them. Its murky, mysterious Orthodox churches are beautiful and full of ancient wonder, but their interiors grow steadily more empty, particularly of the younger generation. The streets are awash in new cars and people, but migration has brought them there, not a boom in Russian reproduction. Russia needs a demographic revival, but if that happens, it will merely be the result of a deeper cultural one. After spending so much time on the business end of some of the worst that the 20th century had to offer, Russia can definitely be forgiven for suffering from an advanced case of cultural malaise. The decaying Soviet monuments in the Exhibiton Centre are more than testaments to a fallen Communist empire, they are testaments to Russia’s damaged sense of identity. We can only work in every way possible and pray that they manage to do that, before it’s too late. Russia is the foremost example of the future of the world we live in. At the beginning of the 20th century there were three systems proposed to mankind: capitalism, fascism, and communism. Capitalism died with the crash of 1929, fascism fell exhausted in Berlin 1945, communism disappeared ignominiously when Boris Yeltsin climbed to that tank in 1991. What we see today are different varieties of a mix of the three where the accent is put sometimes on one, sometimes on other. It is like the legs of the statue in Daniel’s interpretation of the ages: mud mixed with iron. Now a small band of lunatics are trying to turn nature around in a futile effort to defeat God’s Kingdom with the pieces left by a century of violence and despair. Watch closely what happens to the bubble economy in the months to come. Lift up your heads because your liberation is near. Families are going to rebuild the world. Babies will thread the rubble of the “superpowers.” There is only one Super-Power, the One who moves the stars. The One who does not have to conquer space because He made it.